compose songs,whenever his name is mentioned just know that money will be involved. post we will reveal some quick facts about the billionaire and his current net worth this year. 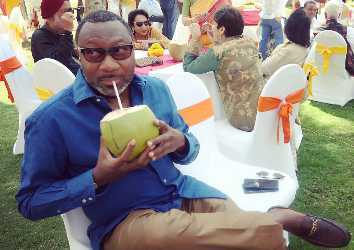 Q: Femi Otedola Quick Facts? 1. Femi Otedola was born in November 4, 1962,he is a seasoned Nigerian businessman and entrepreneur that has interest in the oil and gas sector of the Nigerian economy. He is also the chairman of Forte Oil PLC, a company that specializes in the importation of fuel products. 2. Femi Otedola is also the founder of Zenon Petroleum and Gas Ltd,apart from the oil and gas sector,he also has business interest in shipping, real estate,power generation and finance. 3. Femi was born in Ibadan, Oyo State, Nigeria,he currently resides in Lagos State, Nigeria,he is married to Nana Otedola,he is the father of DJ Cuppy,one of Nigeria’s famous disk jockeys and also a tourism ambassador for Nigeria. 4. Otedola was born in Ibadan, Oyo State,his father was the former Governor of Lagos State. Otedola started off as a marketer for his family's printing press before venturing on to trade petroleum products. 5. Otedola’s company Zenon supply fuel to most of the major manufacturers in the country including Dangote Group, Cadbury, Coca-Cola, Nigerian Breweries, MTN, Unilever, Nestle and Guinness. 6. Femi also acquired a 28.7 per cent stake in African Petroleum, one of Nigeria's largest fuel marketers and he is also one of the major shareholders in two of Nigeria’s biggest commercial banks namely Zenith Bank and United Bank for Africa (UBA). 7. Otedola In March 2009 became the second Nigerian after Aliko Dangote to appear on the Forbes list of billionaires,back then Femi was estimated to be worth $1.2 billion dollars. 8. Due to the slump the global oil market Otedola lost his billionaire status and fell off the forbes list ranking of billionaires. 9. Otedola being a seasoned businessman has other businesses that generates revenue such as CentreForce Ltd,a company specializing in finance, investments and trading,and also Swift Insurance,he is also the president of SeaForce Shipping Company Ltd one of Nigeria's largest ship owner,one of his ships a flat bottomed bunker vessel is one of a kind in Africa. He was also a non executive director of Transnational Corporation of Nigeria. 10. It is also reported that Otedola is very solid in real estate business,he purchased Zenon of Stallion House in Victoria Island in Lagos, from the Nigerian Government,he is also the owner of FO Properties Ltd.
11. Femi is also well connected and often meddle with politicans,it has been reported that he invested in President Obasanjo's re election expenses in 2003,he is also good friends with former President Goodluck Jonathan. 12. Otedola seems to be really close to his children especially DJ Cuppy as he regularly posts pictures of her on his Instagram page which he joined recently,the billionaire has three daughters and a son,he also has a house in London,New York & Lagos. Q: Femi Otedola’s Current Net Worth? Back then in March 2009,Femi Otedola was estimated to be worth $1.2 billion dollars by Forbes,however due to the slump in the price of oil in the global market,Femi's net worth has decreased substantially,as of 2016,he was estimated to be worth US$550 million dollars by Forbes.